Tastemaker, Educator, Sound Designer, and Motor City Proponent. Mike Huckaby has done much for Detroit electronic music. The man behind the once legendary Record Time store has gathered an encyclopedic knowledge of music. He is one of those guys who knows all the roots and culture of electronic dance music. He is a person who can see beyond the hype and divisions within the scene. Mike knows exactly what the music is. 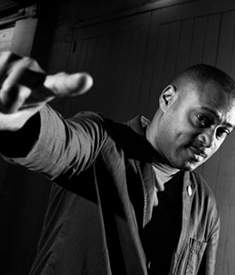 Mike Huckaby has become the busiest remixer from Detroit in the past few years. Mike has been busy producing music on his two labels, Deep Transportation, and S Y N T H, which are well known amongst underground djs worldwide. Mike brings the Detroit sound of deep house and techno with him. He knows the balance between deep house and techno like no other.